There I was in the supermarket buying razors and other glamorous paraphernalia when I saw the false eyelash stand. 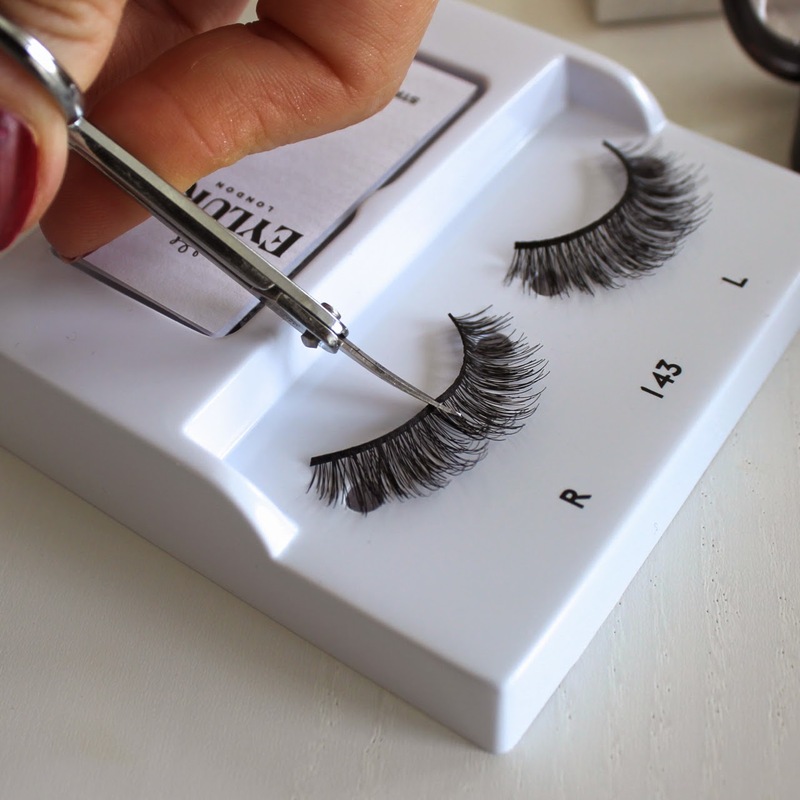 It was packed with lashes and then…then I spotted the Eylure 143's. Similar to those Girl Aloud "Nicola" lashes, albeit a more wearable version, I am not sure if I have ever used these before. Regardless of that fact now I use them every single day. They really are the perfect fluttery false lash, successfully adding thickness and drama without completely overwhelming the eye. I cut them in two and whack half on each eye and end up with something akin to an instant eye lift. Go home and cut the lashes so that you end up with 4 pieces. This will mean that the pack will last at least 4-6 days. Use half a lash from each side on each eye. This ensures that you end up with a tapered finish, with the longer lengths resting on the outer corner. If necessary I trim the ends gently to ensure a better integration on the eye. Apply my trusty Duo glue, wait 30 seconds-ish, and then place on the outer corner. Pull them gently so that they start right on the outer lash line for the ultimate lift and add a little mascara to finish. I am well and truly addicted and although it's added some serious expense to my routine, I can still get ready in the same amount of time. I can't emphasise how much these little bits of plastic give me confidence. You may of course disagree but I don't think they look too outlandish - they give just enough drama and definition. If you haven't tried the Eylure 143 then I highly recommend you go out right now and pick up a pair. Ah I do this too! Best half lashes ever! *high fives* I LOVE these! I dabbled in some other lashes and then found these babies. I like that they aren't mega expensive as well! I just don't have the guts to start wearing false eyelashes even though I love them in other people! I keep thinking that they will somehow move around and I will end up with a false eyelash on my nose or something... Looks great on you though! Okay that gif is making me want to start applying falsies! haha I keep looking at the GIF and wondering why I have to shift my head so much to look down but anyway, I highly recommend these! It will make you feel very "done" even though it's such an easy addition to the makeup routine. Thanks Rena! I hope you managed to find a pair :) I am obsessed! Love them! I was wondering what kind of mascara you were using, your lashes look awesome!! Bourjois Volume 1 Seconde. Still my fav! Well I bought them....and I love them! :) great recommendation Laura! so blummin' easy to put on too! Love the look of the lashes, but im currently a lashes virgin, don't know if i could pull off applying them properly! ahh, may have to make a visit to boots. Ah you have to try Nikita! Half a lash is the way to go if you find them a bit fiddly - that and just the right amount of glue (go for as little as possible). I bet they will look fab! I just saw these in the supermarket today and was contemplating throwing some in my basket! I'm sold. Heading back to Spinneys now!! I love wearing half lashes, gives a flirty look to the eye. Gorgeous! It's worth putting these on everyday if they look this good. I've managed to avoid false lashes for this long, and I think I'll continue without them. It just seems like too much of a slippery slope....I'm sure once I see how amazing they make my eyes look I'll never want to go back! Lashes every day? i don't think I could be bothered. Don't you feel them sitting there? You look unreal in those lashes! I wish I had the patience to wear falsies every day - maybe I'll give it a shot. Could be an interesting beauty experiment! These lashes look amazing, I'll have to see whether they're available in Canada! The eyelashes look great on you, definitely perfect for every day wear. I wish I could rock false eyelashes but they make me feel like I've got a spider on me and it freaks me out. I'm totally normal. I haven't gotten into the false eyelash trend yet, they look great though! These look so lovely! I have been wanting to get more into lashes lately, and the Eyelure ones look great. the look is very Kardashian-Jenner! and I mean that as a compliment! They look so lovely! I'll have to keep a look out for these! Duo glue! I swear by the stuff although it does contain latex and I know many people are allergic to that. if you are not it's the only way to go! I wish I could apply lashes but even with half lashes, I seem to be incapable. They look lovely on you! I bet you could! The key is to apply the right amount of glue - enough to make it stick but not too much. I think that's the tricky bit so I tend to start with a light amount and see how it goes. I'm not a great false lash wearer but these look gorgeous! I might have to pick a pair up the next time I'm in boots! I have tried loads of lashes and never ever set foot outside with any of them. I buy them stick them on decide they look too false and rip them off. Wasted loads doing this. These look so pretty Laura! If you love lashes then you need to try the Velour Mink lashes, they are unreal. I love the Whispie Sweet Nothing style. Thanks Gillian! I wonder if they sell those here….will look into it! Never thought to do this. Good tip! Oooh I will check those out next shop! actually liked this brief post of Musical.ly APK Download And musicallylogin on the application itself or other social media sites network.